A figure dressed in black lay at the base of the left staircase, head covered by a ski mask, a stubby Heckler & Koch MP5K inches from his hand. Surrounding him was a congealing pool of blood. Bishop checked his pulse and found no sign of life. Fifteen feet away leaning against the front doors with his legs splayed out and his chin touching his chest, was Tennison. That makes two then, he thought. The man was bloody but alive and Bishop could hear a faint whistling sound as he breathed. Bishop moved quickly up the white-carpeted stairs. At the top, two passageways ran off the landing. He turned down the left-hand one and pushed open the third door on the left. Inside, an unused bedroom led to another smaller room: the safe room – a small space surrounded by seven inches of concrete. No windows. Only one entrance. No way to break in. Once the interior button was pressed, a reinforced steel fire door slammed down over the doorway. Randall and Natalie Brennan should have been inside, but the steel door had not been engaged. The room was empty. He clenched his jaw tight. Not possible. At the first sign of trouble, the first sign, get the principals to the safe room. It had been drilled into his team enough times. He couldn’t believe both father and daughter had been left exposed during the assault. Oates must have been using the room to grab some shuteye, but he would have woken immediately at the sound of gunfire. Then he should have grabbed them both, brought them back here and sealed them in in less than a minute. Just like he’d been trained. Which meant he’d either screwed up bit time or the hostiles had top intel. Neither option made Bishop feel any better. He heard a faint thump from the floor above. Then a familiar creak on the metal staircase at the end of the other passageway. He ran back towards the landing, stopped and raised his Glock with both hands, his light blue eyes fixed on the exit from the right-hand corridor. A second later, a heavy-set man dressed identically to the dead man downstairs emerged. Over his right shoulder was a large black holdall, in his right hand an MP5K. With his left he was pulling a cotton ski mask down over the bottom half of his face. On his right sleeve was a blood-smeared rip. Bishop stepped out. ‘Halt,’ he said. Instead, the man turned quickly and Bishop’s reflexes and training took over. He fired three shots straight at his chest. They all hit home. The man grunted and fell backwards down the curving staircase, bouncing off the banister and landing on the floor, sprawled on his back. Almost a mirror image of his friend on the other side. Bishop looked over the railing and waited until the blood seeped through the man’s clothing where the rounds had hit. He ran down the right-hand passageway and leapt three steps at a time up the small spiral staircase. At the top, he pushed through the double doors to Brennan’s office. He almost tripped over Oates’s body. The young ex-soldier lay on his back just inside the double doors, three dark stains on his unprotected chest, his light brown eyes staring sightlessly at the ceiling. His gun lay a few inches from his outstretched hand. Although he’d only been in the team eight months, Oates had been a good protection officer, the soldier in him ever alert. Yet somehow the enemy had managed to take him totally by surprise. Bishop saw the large antique desk in front of the window was undisturbed. On it was a state-of-the-art laptop and a small silver-framed photograph of the smiling family. Directly in front of the desk, Natalie had been stripped to her waist and tied to a chair. Her body was drenched in blood from the neck down and the carpet underneath was soaked. Bishop could see straight away she was dead. On Bishop’s right the selection of photos on what Brennan smugly called his Wall of Fame watched him. At his left were two floor-to-ceiling bookcases. One had been pushed aside to reveal a thick steel door, partly open. That was when Bishop knew the attackers were professionals. Until that moment he himself had had no knowledge of any secret vault. Close to the door, the silver-haired Randall Brennan lay stretched out on his side, his eyes open under a creased brow, his mouth slack. He ooked like he was contemplating the crimson pattern on the carpet in front of him, except that his throat had been cut. Bishop turned and stepped over to Natalie. Her throat had also been cut and her head had rolled to the side, her long black hair obscuring her features. Countless lacerations haphazardly criss0crossed her torso and breasts above a deep stab wound in her flat stomach. Crouching at her side, Bishop looked up at her open blue eyes for a long time and gently touched her cheek. The pale blemish-free skin still felt faintly warm against his palm. ‘Jesus.’ Seventeen years old and her life already over. He studied the cuts on her chest. They looked frantic, as if the killer had gone at her in a frenzy. Like you’d find in a lover’s murder, not a professional hit. What the hell was going on? Bishop turned to check Randall Brennan for similar cuts and saw his missing knife lying next to the body. Bishop studied him as sirens sounded in the distance. Watched as Chaney’s blood began to pool on the carpet and his thigh muscles started to contract. And it dawned on him why he’d been left unharmed. An inside man. A nice scapegoat for the cops. 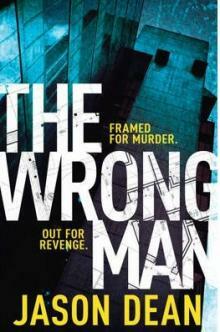 Available in hardback, paperback, Kindle and audiobook versions, The Wrong Man is available at Amazon, Waterstones, Tesco and iTunes.